Gladstone's Library has been recognised as the most important research library and collection in Wales after the National Library of Wales in Aberystwyth. It boasts an outstanding collection of more than 250,000 books, journals and pamphlets on a wide range of subjects but specialising in our core subject areas of Theology and Victorian Studies. This unique collection is kept up-to-date with the latest publications which readers can browse on the open shelves. 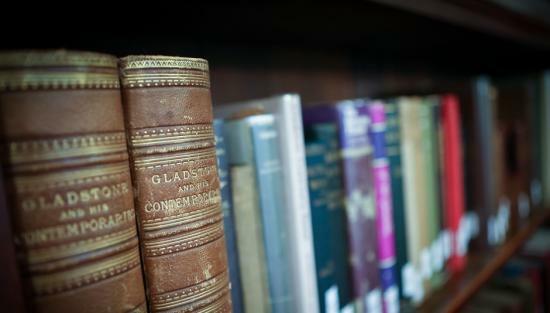 The heart of the Library is Gladstone's own collection of over 32,000 items. Many of his books contain his annotations, some of which are extremely detailed. In addition to his books, the Library houses most of Gladstone's non-political correspondence, speeches and papers which are administered by the Flintshire Record Office and a number of special collections including the Bishop Moorman Franciscan Library and the Glynne-Gladstone Manuscripts. If you have any questions about using the Library, please contact Patsy Williams or Anna Richards.